San Giovanni Valdarno is a town of the Valdarno di Sopra, whose current historical centre was the first of the New Lands of the Florentine Republic, founded at the end of the 13th century. The historical transformation of the original walled nucleus has been the subject of many studies, but the logic of the primary design has not been much investigated. The archaeological approach is therefore justified by the fact that, to date, as far as the original urban design is concerned, the published studies do not go far beyond the definition of «orthogonal design» given by David Friedman, the major scholar who investigated the topic. The judgments on medieval San Giovanni do not go beyond the generic attribution of virtues and defects that the historiographical tradition attaches to the medieval city, applying formulas based on conventional paradigms. 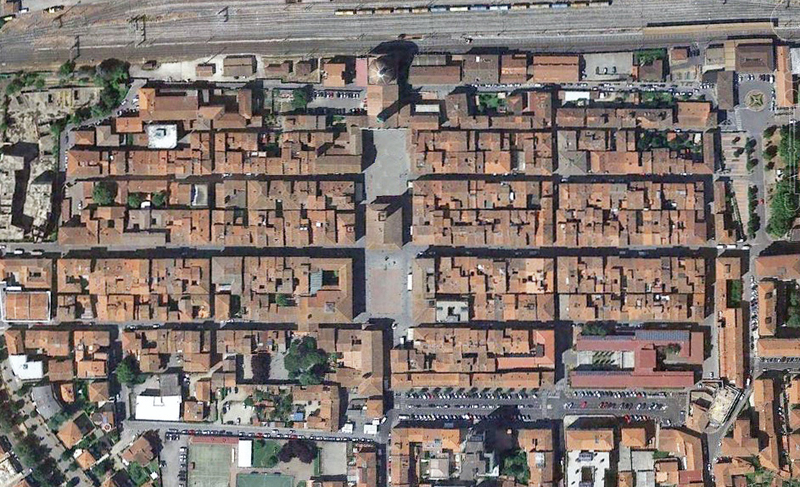 Looking for a significant description of the material fabric of the city resting on genuine paradigms of the time of its realization, a metric study is conducted on the shape of the historic city, referring to the Florentine «braccio da panno» metric system, considered as a fundamental reference paradigm to understand an artefact of urban dimension. The archaeological aspect of the research therefore consists in the complex reconstruction of a forgotten paradigm, in the light of which meanings and values of an historical object fallen out of the transmitted memory emerge in a renewed light. The analysis of the digital plan, with the support of Gothic and Renaissance documents, reveals the logical and continuous order of the founded city geometrical design, replicable in mind (and therefore memorable), carried out in the urban plan, making its logic explicit through connections with both the scientific culture of its time and the previous historical tradition, dating back to Vitruvio. To correctly interpret the ratio of subsequent urban transformations, a certain point of departure and the criteria to which it has been conformed are relevant, especially when they prove that these criteria were not gratuitous, but, rather, responded to «utilitas» (in the Vitruvian sense), looking for the well-being of its inhabitants in a way even today opportune.